Please can someone tell me what the 4 jumpers on this VGA card do? You can see them at the bottom, to the right of the wording "ALL RIGHTS RESERVED". They are labelled J4 J3 J2 J1. They all have jumpers on them, except for the jumper on the right (J1), which is open. Thanks a lot. Have you tried tracing the circuits? I found a picture of another one and it looks very little like yours for some reason. Last edited by sliderider on 2011-6-15 @ 00:29, edited 1 time in total. I might try "random" jumper configurations first, and just see what happens. I notice that this card behaves oddly if I set the mobo's bus speed to 50. I wonder if one or more jumpers on this VGA card sets the bus speed, and if so, it might be currently set to <=33. If I remove this VGA card, and try another (Trident) that has its jumpers set to "50 MHz bus speed", I get no problems. 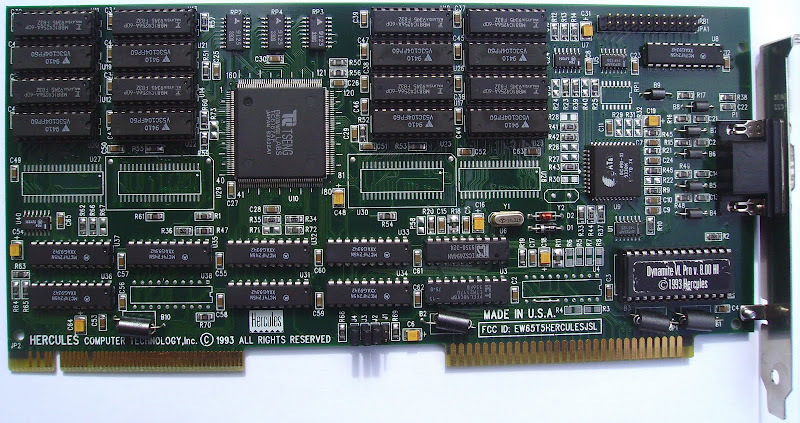 I tried random jumper configurations on this card, 15 of them in fact, but I couldn't get this VGA card stable @ 50 MHz mobo bus speed. Perhaps I should have removed the VLB IO controller, and used an ISA IO controller instead? However, this VLB IO controller + a Trident VLB VGA card @ 50 MHz bus speed worked OK, so I'm a bit disappointed that this Hercules VGA card couldn't perform in the same way. I thought that a Trident outperforming a Hercules Tseng ET4000 Pro card could only occur inside some kind of warped alternate universe. If you want the DOS, Windows 3x and Windows 95 software, it's here and here. That's disk 1 and 2, version 4. I hope it's the latest version. It should be, I think. I just archived the software using the .7z format. There's nothing fancy about it in terms of file structure. Just a couple of self exstracting .exes. Please note that on disk 2, there's an upwin.bat file which will update your Windows 3x driver files. In order to adjust the refresh rates inside Windows 95, you have to install DOS software (from the links above). This will install a DOS utility called SETCRT.exe. You can also pick your monitor type. On my LCD, the highest resolution I could get was 1024x768 @ 60 Hz. The card will not work at 60 Hz @ 1280x1024, because it insists that this resolution must be displayed in interlaced mode @ 87 Hz. This cannot be done on my LCD. It's a shame that some VLB cards do this. Some don't however. I've tested a bunch of these VLB cards now, and at least a third are sensible enough to offer you 60 Hz @ 1280x1024. But not this one. The weird thing is that if you look at the info image below (2nd pic down), it thinks the monitor is non-interlaced 1280x1024, which it is. So why can't the card can't cope with that resolution + refresh rate? Using the VGA card in Windows 3x. 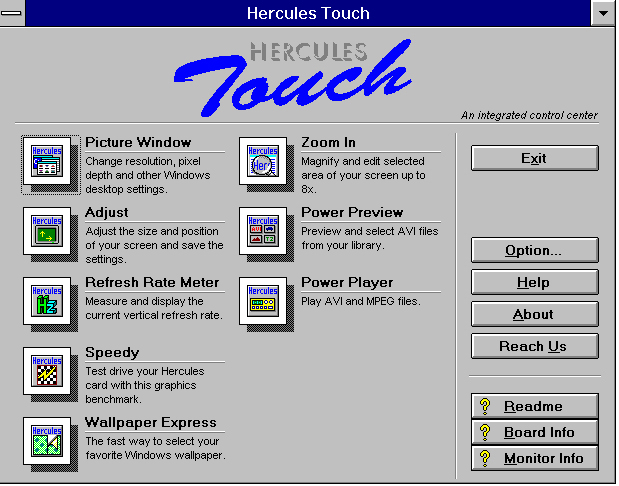 Hercules Touch - its control panel. Info about the card, in Windows 3x. Speedy, the card's benchmarking utility. This image appears incorrect. A lot of the colours and imagery have disappeared. I'm not surprised it doesn't do 1280x1024 NI. Look a the crappy little RAMDAC that comes with that card. How did you even get 1024x768 NI working properly? I was pretty sure the ET4000W32I only did up to 800x600NI. In any case, almost nobody ran 1280x1024 back then, because their monitors couldn't handle it (at a decent refresh rate anyway), and it was too damn slow. retro games 100 wrote: So why can't the card can't cope with that resolution + refresh rate? Most likely because the RAMDAC is too slow to keep up. 1280x1024x60Hz needs at least a 110 MHz pixel clock (more if you don't want a very blurry picture), while 87 Hz interlaced only requires about 80 MHz (in interlaced modes the RAMDAC only needs to be half as fast, because it only scans every second line). For more details, see Wikipedia's entry for RAMDAC. Ah, thanks a lot for the retro wisdom people! It's good to know that I was unwittingly pushing this thing beyond its capabilities. I edited the "myscreen.crt" file, and set the refresh rate modes to the ones that I wanted. I chose the value of 1 (meaning 60Hz) for 1024x768x8-bit. When the system rebooted, I noticed that the SETCRT .exe displayed the new modes and refresh rates, and that all of them were set to 60 Hz and non-interlaced, except for the 1280x1024 resolution. But I did notice one thing however. 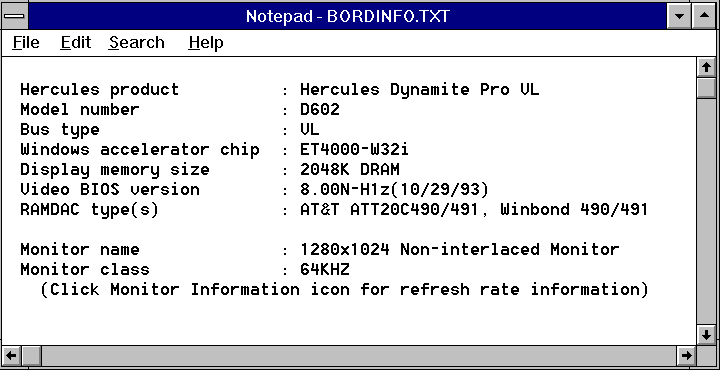 The Hercules card in Windows 3x displayed odd behaviour when running at 1024x768x8-bit NI mode. When I say odd behaviour, I mean that when Windows 3x was shut down, it hung. I then had to reset the machine. So, that explains things. I was worried that the hardware and/or driver software was buggy. Now I know that I was asking it to do more than it could. Thanks for the info! BTW, WinTune 2.0 for Windows 3x worked OK at 1024x768 NI, so it was useable. Brain update: I just remembered something. It only hung when I tried to shut down Windows 3 after I did the Speedy benchmark. If I ran Wintune, and then shut down, it was OK.
please, be so kind and don't hotlink the 1xxx pixel pictures from my website. this causes a lot of traffic. if you find a useful picutre, just use a smaller size with a link to the original size. I thought for a moment there you were talking to me! oh no, sorry, this was not for you. but if it was: never mind, everything is fine. many people just not know how much traffic is caused by hotlinking large pictures. that's why i made this post public instead of sending a private message.